Organic food choices are becoming more available in supermarkets, but consumers still must continue to check labels as big business tries to bend the rules of the organic standards. Consumer spending on organic products is on the rise: more than 20 percent in the last ten years alone, according to Consumer Reports. Naturally, this has attracted the attention of corporate players. While at first glance, this seems like a great victory for organic consumers — think supply and demand — it actually may put the entire industry at risk. What you may not know is the extent of natural and organic brands already wholly- or partially-owned by giant corporations. Hain Food Group, owner of dozens of organic brands, has its stock principally held by Bank of America, Entergy Nuclear, ExxonMobil, H.J. Heinz, Philip Morris and Walmart, among others. Not exactly the mom and pop list you might expect. Other corporate giants have either introduced their own organic brands (e.g., Tyson's Nature's Farm Organic, Unilever's Ben and Jerry's Organic and Kellogg's Sunrise Organic) or snatched up smaller independent brands (e.g., General Mills acquired Cascadian Farms along with Muir Glen in December 1999; Kellogg bought up Kashi in June 2000 and Morningstar Farms/Natural Touch in November 1999; and Danone grabbed 80% equity of Stonyfield Farms in January 2004). Click here to see the Organic Industry Structure from The Center for Agroecology & Sustainable Food Systems. While at first glance, this seems like a great victory for organic consumers — think supply and demand — it actually may put the entire industry at risk. It is safe to assume that these large corporations have profits, rather than sustainable agriculture, in mind. Since the National Organic Standards were finalized in 2002, they have been under attack by large corporations and the USDA. Their goal: to weaken the standard by allowing previously-banned synthetic ingredients and hormones back into the production of organic food. Weaker standards mean lower costs in organic food production, which ultimately yield more profits. If these companies succeed in weakening the standards, consumer trust will be lost and the entire organic industry could collapse. Why pay more for an organic product containing synthetic ingredients? Why support factory farming hidden under an organic label? That is exactly what happened in October 2005. With the help of the Organic Trade Association, Congress pushed through an amendment weakening organic labeling. At risk were organic products containing synthetic ingredients (see Behind the Label, below) and large-scale dairy production. Back in June 2005, a ruling for elimination of all synthetic ingredients went into affect, giving just 12 months for companies to meet the stricter requirements of lose their organic labeling. That would have cost millions for the borderline-organic companies and the Organic Trade Association wanted none of that. Under the amendment, numerous synthetic food additives and processing aids can continue to be used in organic foods. Worse, young dairy cows can be treated with antibiotics and fed genetically engineered feed prior to being converted to organic production. And last, loopholes allow non-organic ingredients to be used based on "emergency decrees" in which there exists a shortage of organic goods (as determined by USDA, not the U.S. public). Enter the Organic Consumers Association and their program to protect the integrity of organic labeling — SOS: Safeguard Organic Standards. Under the original 2002 standard, a limited list of synthetic ingredients was always allowed in organic food production. However, that list was to be reviewed after five years in the hopes of phasing out or eliminating certain non-natural ingredients. With the new amendment, those hopes are gone. OCA is lobbying to repeal the amendment in 2006 and is looking for support to do so. They hope to protect the years of hard work by the small, independent farmers who have built the organic community before big business took notice. For more information, including what you can do to help, check out http://www.organicconsumers.org/sos.cfm. According to information on Horizon Organic packaging, cows are allowed to make milk according to their natural cycles and are given organic feed, fresh air and plenty of pasture. Yet, in an exposé by The Cornucopia Institute (an agricultural policy research group that supports family-scale farmers), Horizon Organics' lack of pasture-fed dairy farming was revealed. Photos of the company's 4,000-plus cow factory farm in Idaho show the farmland — what is termed "the desert" — along with tight rows of cows in an assembly-line milking. The thousands of cows are granted limited access to pasture under the loose wording in the federal requirement where cows can temporarily be penned if conditions are unsafe or to protect soil/water quality. It would seem that Horizon, owned by milk giant Dean Foods, is taking full advantage of this loophole by making it standard operating procedure. In response to a legal complaint filed in 2005 by Cornucopia, Dean Foods will be spending $10 million to upgrade the farm's equipment and add pasture — a move cited as "greenwashing" by Cornucopia. Dairy Update, April 2006: Cornucopia Institute did an extensive year-long review of the nation's organic dairy farms and private-label dairy brands. See which brands and dairy products are produced with the best organic farming practices so you can choose wisely. Read the full report, Maintaining the Integrity of Organic Milk. Or check the dairy rankings to see how the products in your local dairy case stack up. 100% Organic. This is what you would expect: products made with only organic ingredients. By law, nothing synthetic is allowed. Also, production processes must meet federal organic standards and must have been independently verified by accredited inspectors. This is what the Organic Consumers Association is pushing for and what the Organic Trade Association along with the USDA and big business is afraid of. 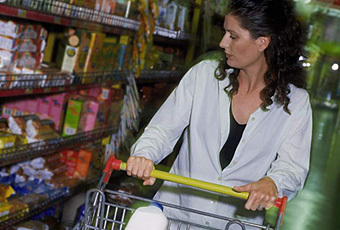 Foods under this category can bear the USDA Organic label. Organic. Here's the gray area: at least 95 percent of the ingredients need to be organically produced. The remainder can be non-organic or synthetic ingredients. Foods under this category can bear the USDA Organic label. Made with Organic Ingredients. Products in this category contain at least 70 percent organic ingredients. The remaining 30 percent must come from the USDA's approved list. Next time, before grabbing that can, carton, bag or box bearing the organic seal, check the ingredient list. Make sure you know what is included now that you know organic is not always what it promises to be. And use extreme caution with products labeled "free range" and "all natural" as there are no standards governing these labels. © 2007 GreenPromise.com All rights reserved. Help save the planet by spreading the news about natural and organic products and how to live an organic and green lifestyle. For reprint permission, contact the Green Promise editorial staff at reprints@greenpromise.com.